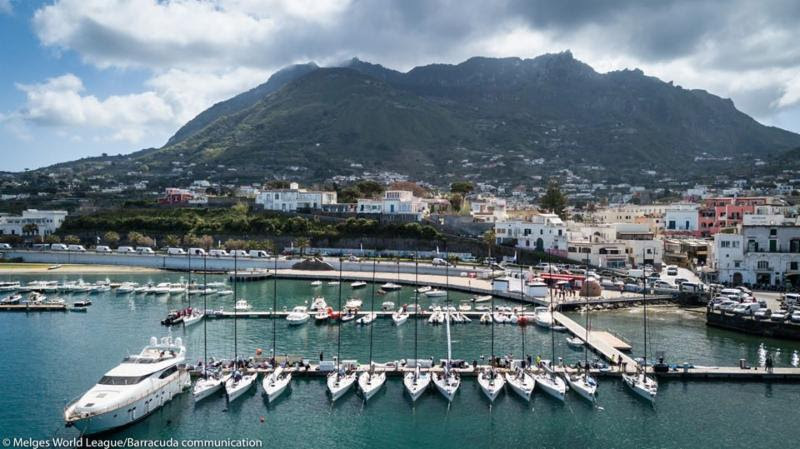 Forio d'Ischia, Italy (April 13, 2018) - The 2018 Melges 32 World League, European Division season is off to a little bit of a slow start in Forio d'Ischia, Italy. Unfortunately, the breeze did not show up for the first day of scheduled racing, but it looks like it's well on the way for Saturday and Sunday's rounds of competition. Despite the lack of breeze, the parties raged on. Melges 32 teams happily attended the Mozzarella Party hosted in the Melges World League Regatta Village. Fresh mozzarella was provided by Costanzo, beer by Nastro Azzurro, wine compliments of Cenatiempo and music by DJ Simonex2. The first warning for Saturday's racing is at 11.00.